Armour's Answers – How Could Light Exist Without The Sun and The Stars? The sequence of creation presented in the first chapter of the biblical book of Genesis is, in general, logical and consistent with scientific knowledge, with one major exception: the Bible seems to indicate that the sun and the stars were not created until the fourth day, which was three days after light was created. How could there have been light without the existence of the sun and the stars? However, it can be argued that if all God did on the fourth day of creation was to cause the sun and the stars to become visible, He really did not create anything that day – all He did was remove an obstruction that obscured the visibility of the sun and the stars. Therefore, we do not think this explanation has merit. I believe the command “Let there be light” resulted in the creation of energy in the form of photons of all possible energy levels. . . . [I]t is reasonable that God’s raw material for the subsequent stages of construction of the universe consisted of atomic elements as building blocks, as well as a reservoir of universal energy which would be modified and placed, for example, into the sun and stars on Day Four. [I]n some way we probably can not now grasp or adequately describe, light and darkness were divided on Day One by some kind of barrier. Various suggestions have been made about what this light might have been. Could it have been a mass of glowing matter that was later shaped into the sun? Or (as seems more likely) could it have been a disembodied light, an ethereal temporary brilliance decreed by God to illuminate His creation until permanent lights were set in place? The nature of this light is not described. We are simply told that light existed because God told it to exist. And it should not be difficult for us to believe that One whose glory is described as pure light could command light to appear even before there were any stars or sun to embody that light. [The original light] might have been a pure display of divine glory, much like the light that will shine in New Jerusalem, described in Revelation 21:23: “The city had no need of the sun or of the moon to shine in it, for the glory of God illuminated it.” In any case, its source was very clearly God. . . . But on day four, God created the sun and moon to be permanent heavenly luminaries. The source and creator of the light was still God, but from now on there would be light-bearing bodies that would perpetually shine their light on the earth at the proper intervals and seasons. In the original Hebrew language, there are two concepts about how God brings things into existence. One way God does things is by a miraculous process that only God can do. The Hebrew word bara was used to indicate this process. . . . It is a term reserved exclusively to describe God’s actions in the Creation. The Jewish Publication Society says, “The Hebrew bara is used in the Bible exclusively of divine creativity. . . . [B]ara is used in Genesis 1:1 and again in Genesis 1:21 and 1:27. There is another way that God brings things into existence. This is a process that does not involve a miracle but rather is a shaping or molding of something already created. The Hebrew words used to describe this process are asah and yatsar. . . . God is described as having asahed things in the biblical record with everything from verse 2 through verse 19 being included in this process. [T]he Bible ends the creation story by saying that God “rested from all his work which God created (bara) and made (asah).” According to God, both processes were used. The first verse of Genesis is a creation (bara) verse, not a making (asah) verse. The things created, according to verse 1, are the heaven (shamayim) and the earth. What this means is that everything above and everything below were brought into existence by a miraculous act of God. 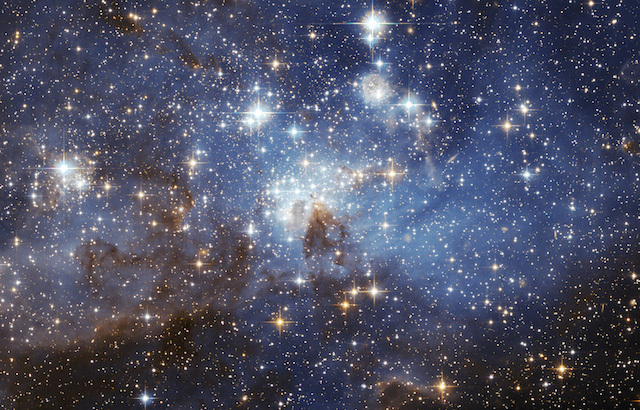 If the shamayim includes everything in the sky, this includes the sun, moon, and the stars. Someone might argue that these objects are described in verses 14 through 19, but notice that the word used in these verses is making (asah) not creating (bara). The objects were created in verse 1, the light reached the earth from these objects in verse 3, but you could not establish “signs, seasons, days and years” until verses 14 through 19. Based upon the preceding information, we believe there is ample reason to believe that the sequence of creation recorded in Genesis is accurate and that it provides additional support for the belief that the Bible is the infallible Word of God.